The Mexican government reacted to the video of a 3,000 men strong migrant caravan heading for their border by sending two planeloads of federal forces to the city of Tapachula, where the group is expected to cross into Mexico. The deployment suggested that Mexico would not allow the caravan to head north together as it did with a similar group in April. By now, almost 3,000 people, mostly from Honduras, have joined the convoy of people traveling on masse through Central America. On Wednesday, the column stretched for miles down Guatemala’s R18, the migrants sometimes taking up two lanes of the road, and sometimes hitching rides on pickup trucks and buses. The US President had vowed earlier this week to cut off all aid to Central American countries if they didn’t intervene. Today he went one step further and threatened to completely close off the Southern US border. Any closure of the southern border would be extremely disruptive to trade relations between the US and Mexico who have recently signed a new USMCA trade agreement to replace the, in Trump’s words, faulty NAFTA agreement. 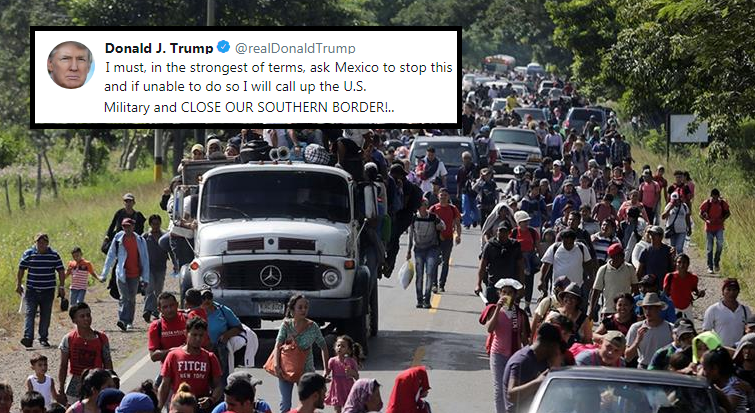 With a caravan of a few thousand migrants heading for the US border once again in the news headlines, the US President is keen to show his supporters that he stands with them in the midterms and remains very tough on immigration. notice that these poor poor people are all fat and well clothed. Good! It`s about time seal the borders, enact martial law, do whatever it takes. Let the dims & all who oppose in congress take a recess like children, while the men stay write & enact bills & laws to fix what the liberal left`s & globalist`s worked so hard to nearly bring about. Finally a leader that stands up for our Country regardless of the heat the media dishes out. I am all for locking down the borders for like 10 years. During that time we can deport the aliens, work at securing our borders, and make America American again.